SIDE VIEW/REAR VIEW CCD COLOR WEATHER/WATER-PROOF WIDE ANGLE CONVENIENT ANGLE ADJUSTMENT NIGHT VISION INFRARED CAMERA- FIVE COLOR OPTIONS! GREAT PRODUCTS FOR CARS, TRUCKS, RVs, BOATS AND VANS! A side view camera provides a comprehensive view of areas surrounding a vehicle to eliminates the front and side blind spots for larger vehicles like lifted trucks, RVs, or any vehicle with a long hood. It mounts easily behind the your vehicle's grille, with a wide angle view to both sides to improve your visibility. This side view camera can also be switched between normal view and reverse view easily. It is a great product for use in any type of vehicle with either poor rear view visibility, none at all, or for those times when you just want to have the convenience of being able to see a wider field of vision than you get from using a standard rear view mirror or looking over your shoulder while steering your vehicle. This product is versatile and is meant for everyday use in any car, RV, van, truck, bus, boat, personal watercraft, and even aircraft!!! Basically, if you want the piece of mind that comes with knowing where you're going in order to protect your property and those of others then this is the product for you. We stand behind our product (literally!!!) to make sure that you, the customer, is getting the best product out on the market today at the most competitive price. One CCD COLOR Weather/Water-Proof Vehicle Side View Camera With Wide View Angle and Night Vision Infrared. Camera comes with normal/reverse image jump connector, RCA video output socket, and power input. All the necessary cable hookups and Male Power Lead Plug to get your camera up and running. NOTE: We have five color options: Red, Green, Yellow, Silver and Black. Please advise color preference. 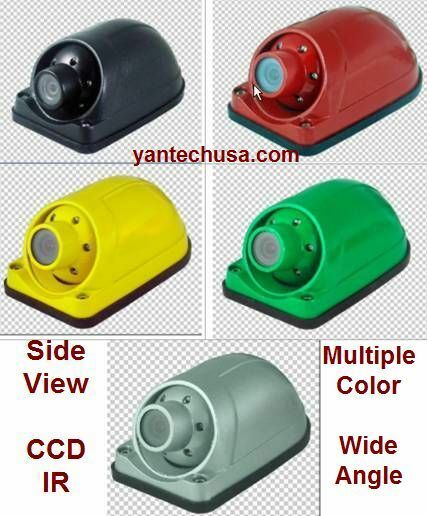 If your preference is not chosen then the color choice will be at the discretion of YanTech USA. Changing the color after postage will incur $20 postage and handling fees. LCD VIEWING MONITOR SOLD SEPARATELY. WE HAVE VARIOUS MONITORS FOR YOU TO CHOOSE. PLEASE VISIT OUR OTHER LISTINGS WHICH ARE SHOWCASED AT THE BOTTOM OF THE PAGE. YOU CAN CHOOSE ANY MONITOR FROM THE COMBO ITEM LISTING(LCD MONITOR + CCD CAMERA) AND PURCHASE WITH THIS CAMERA. Water-proof without extra housing and vandal proof: for part (camera glass lens) exposed to outside ONLY and for normal usage ONLY. Camera body and cables are not designed to be exposed to outside and must be properly sealed against moisture. Incorrect installation and using the product in opposition to the manufacturer's instructions MAY result in loosing water-proof feature.